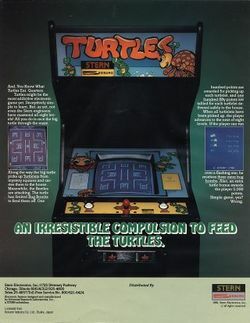 Turtles is a 1981 arcade game published by Stern Electronics that is an alteration of an arcade game originally developed by Konami called 600. In both games, a Mama turtle must rescue all of her baby turtles from a maze and return them home while avoiding contact with enemies. However, like its title, 600 was a little more abstract. In 600, the turtle's enemies were a set of race cars (running around the hallways inside of the building). The race cars were transformed into Beetles for the audience outside of Japan. There were a couple of other important changes. In 600, the mother had to collect all of the babies in the stage before the exit appeared, and she would bring them all home at one time. 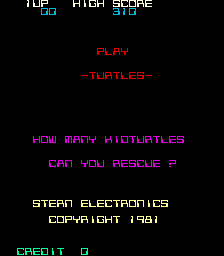 In Turtles, the player must collect and return each baby individually in order to proceed through the game, making Turtles much longer more challenging to play. In 600, the mother turtle could release "bombs" that could stun the enemy race cars. These bombs depleted an energy meter which the baby turtles would partially refill. In Turtles, the player has a determined stock of bombs, that can only be increased by collecting the blinking bomb icon whenever it appears in the center of the maze. It is much easier to run out of bombs in Turtles and end up defenseless than it is in 600. The game was also licensed to Sega, who renamed it Turpin and used Stern's concept of the game rather than Konami's, although it is unclear what the licensing arrangement between all three companies were. Turtles was not a huge success, and it bears the distinction of being ported to three of the most obscure consoles available; the Arcade 2001, the Magnavox Odyssey², and the Entex Adventure Vision which was a standalone console that used a rotating mirror and red LEDs (much like Nintendo's Virtual Boy). Only three other games were created for the system. Mama Turtle's babies have been kidnapped. They are scattered through eight floor of a tall building. Help Mama get in and rescue the babies from each floor while avoiding the dangerous enemies that lie waiting within. Joystick: Use the joystick to guide Mama Turtle in any one of four directions through the maze. Bug Bomb: Press this button to lay a bug bomb down on the floor in your current position. You can only lay a bug bomb if you have any in supply, and you may only leave one bomb on the screen at a time. You control Mama Turtle in her attempt to rescue all of her kidnapped babies from inside an eight story building. Mame must search inside the mystery boxes to find her children while avoiding being captured by the Beetles. One touch from them means death. To protect herself, Mame can lay down on Bug Bomb at a time. Until that bomb is detonated by a Beetle, or it expires, Mama cannot lay another bomb down. When a Beetle is stunned, Mama can safely walk through the Beetle without fear of dying. These enemies patrol each floor of the building. Three Beetles freely wander the halls at the start of the first four floors, and Four Beetles in the remaining floors (as well as the first floor of every new building). Two more enemies are hidden underneath the mystery boxes, and can harm Mama as soon as they're revealed. Once a total of five Beetles a running around, no more can appear. Beetles start out brown and slow. They turn tan after a while and pick up some speed. Eventually they turn blue, and become very fast and intelligent. Blue Beetles will run straight towards Mama as fast as they can. Beetles can only be stunned by Bug Bombs. When they are stunned, they drop down one color class before continuing. Beetles can not run through each other, including when they are stunned. In this way, a stunned Beetle can serve as a blockade to help Mama escape from other Beetles. In 600, the enemies are three race cars, with two faster cars hidden by the Mystery Boxes. The slower cars never increase in speed or intelligence. In order to find her babies, Mama Turtle must examine the 8 Mystery Boxes arranged throughout each floor. Six or seven of them will contain babies, while the remainder contain extra enemies. The only way to find out which is which is by touching them. At that time, the contents will be revealed. Because you never know which boxes contain enemies, it is a good strategy to reverse away from the box as soon as you touch it. If it is a baby, then the baby will automatically climb on your back before the action will continue. If it is an enemy, it will shimmer for a fraction of a second before pursuing you. It's a good idea to drop a Bug Bomb behind you after you discover one so you can put more distance between you and the new enemy. You do not have to reveal the contents of all eight boxes to clear the stage, you need only find all of the babies. Baby Turtles are what you ultimately seek. There are six babies in the first four floors, and seven in the last four (as well as the first floor of a new building) hidden inside the Mystery Boxes. Once you pick on up, a House will appear in one of the four corners. You must safely return the baby to the blinking house before you can examine another Mystery Box. If you die in the process of returning a baby, that baby will be returned to the Mystery Box before you continue. In 600, you have to collect all of the babies before an exit will appear, which leads you out of the stage. Mama Turtle begins the game with a supply of three bombs. Periodically throughout the game, a large red bomb will appear in the middle of the stage. Collecting this will add three more bombs to Mama's supply. Collect as many as these as is conveniently possible without putting Mama at risk. When you press the Bug Bomb button, one of the small bombs is deposited on the path where Mama was standing at that time. The bomb will flash for a long while waiting for a Beetle to come along. If no Beetle comes after a long time, the bomb expires and you are free to lay another one. In 600, you have an energy meter. Depositing a bomb depletes the energy meter, and collecting a baby refules it slightly. Your meter refills at the start of each stage. There four are distinct layouts of the floors throughout the game. Each arrangement occurs over two consecutive floors. This page was last edited on 12 April 2015, at 13:31.